I’m working on a couple of posts about Christmas and New Year’s, but I’ve been busy this week so they aren’t ready for publishing yet. I’ll finish them this weekend. For now you’ll have to be content with this recipe for delicious homemade cranberry sauce! On Christmas Eve I cobbled together a batch of cranberry sauce from a couple of basic recipes I found on Pinterest – one from Cooking Light and one from McCormick’s. I used elements of each one, but pretty much just threw a little bit of this and a little bit of that (including some ingredients that nether recipe called for) into the pot and hoped for the best. Fortunately it turned out great! It was the perfect complement to the smoked turkey we had for Christmas dinner, and the leftovers refrigerated really well for leftovers a couple of days later. I liked it so much that I made another batch of cranberry sauce on New Year’s Eve after I got back to California. Hey, the holidays aren’t over until I have to go back to work! (Which was actually today, but that’s another story.) I’m going to enjoy this cranberry sauce over some baked chicken this weekend. So if you have a hankering for cranberry sauce even though Christmas 2014 is over, try this recipe! Otherwise, save it until Thanksgiving 2015 and try it then! In a small or medium saucepan, combine all ingredients and bring to a boil over medium-high heat. Reduce heat to medium-low and simmer 10-15 minutes, stirring occasionally, until the cranberries pop and the mixture starts to thicken. Remove from heat and cool completely. The sauce will thicken more as it stands. Serve over turkey or chicken, or as a stand alone side dish. Enjoy! 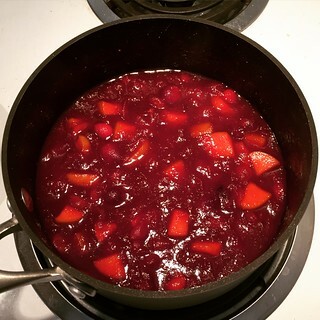 Based on Cooking Light’s Basic Cranberry Sauce and McCormick’s Homemade Cranberry Sauce. 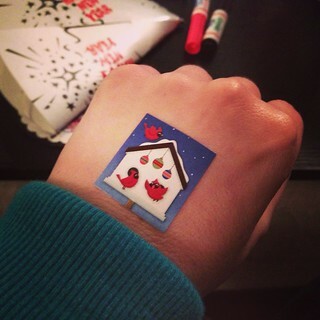 One of the kids at the New Year’s Eve party I went to put this sticker on my hand. It was so sweet that I left it on there as long as possible. Pulling it off my skin at the end of the night didn’t feel so great, but I still loved it. Chocolate chip cookies #40: Based on Cooking on the Weekends’ Olive Oil Chocolate Chip Cookies. 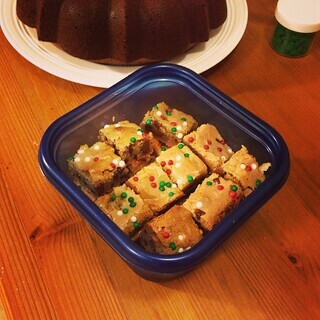 Baked on 12/31/13. More holiday-themed chocolate chip cookies! Well, not really, since the sprinkles are the only thing that make them holiday-specific, but I took these to the New Year’s Eve party I went to. One of my friends requested cookies (and since she is now cancer-free after a fight against lymphoma I’ll pretty much give her whatever she wants) so I took my last legitimate opportunity of the season to add some Christmas sprinkles to the top of the dough before baking. Pretty! With or without decoration, these olive oil chocolate chip cookies are perfect for when you’re out of butter. Or when you don’t want to wait for the butter to soften. Or when you don’t want to break out the electric mixer to cream the butter. (Not that I ever use my electric mixer anymore. Leaving the butter sitting on the counter overnight usually makes a wooden spoon sufficient for mixing cookie dough.) I consulted two different recipes before making these cookies – 1) this one from From Which Things Grow which didn’t seem to have a large enough proportion of olive oil compared to amounts of the rest of the ingredients, and 2) this one from Cooking on the Weekends which seemed more reasonable, but still wasn’t quite right. In the end I used my recipe for perfect chocolate chip cookie bars and just replaced the butter with extra light olive oil. Note that this is NOT the same as extra virgin olive oil. The extra light variety is great for baking – the extra virgin variety is not. The bottom line here is that these cookies are delicious. Try them for yourself! I’ve been slowly putting together a list of resolutions for 2014, and this is the first one that I thought of. Food would be the first thing that came to my mind, wouldn’t it? Well, eating breakfast is a relatively new thing for me, but after I started running last summer I realized it was an essential meal. On nights that I run I can’t eat a lot beforehand (stomach aches, you know), and I have very little appetite afterwards, so dinner is pretty much nonexistent. That means my breakfasts and lunches on running days need to be a little more substantial. Special K protein shakes just don’t cut it on those days! Jimmy Dean Delights frozen breakfast sandwiches have been my go-to on weekdays when I’m in a rush because I can heat one up in the microwave when I get to work. They get old kinda fast, though. When I have a little more time (usually weekends since I can’t seem to get up as early as I’d like during the week anymore) I get breakfast someplace like McDonald’s, Panera, or Corner Bakery. Egg sandwiches are my new favorite thing, but going out to get them can be annoying. So when I saw an ad for the Hamilton Beach Breakfast Sandwich Maker I ran right out and got one! It wasn’t expensive and it doesn’t take up a lot of counter space so I’m hoping I’ll be able to use it to make delicious homemade breakfast sandwiches. I haven’t used it yet, but today I bought eggs (well, MORE eggs since I already had a bunch in the fridge for cookie baking), English muffins, ham, and cheese to give it a try tomorrow morning. Fingers crossed! And since I can’t live on egg sandwiches alone, yesterday I ordered a Cuisinart Compact Portable Blender to try my hand at homemade smoothies. I found a few recipes on Pinterest that look good, but I have a feeling it’s going to take several failed attempts before I figure out what works best for my picky taste buds. I’ll let you know how it goes. There will be some interesting experiments to share, if nothing else! New Year’s Day was extremely productive since I went to bed at a fairly decent time the night before. But evidently everyone else stayed up to ring in the new year because when I went to Target the morning of January 1st it was empty. I’ve never seen so few people at a Target in Los Angeles! My original plan was to just pick up one item and then head right back home, but after seeing how deserted the place was I grabbed a basket and bought quite a few things. The reason I went to Target in the first place was to buy a bathroom scale. I haven’t had access to one in over a year (which was liberating, actually), but I joined a 2014 weight loss challenge that forced me (reluctantly) to buy one. On my way home from Target I got a breakfast sandwich at Panera for breakfast. Of course I didn’t eat it until after I got home and weighed myself on my brand new scale! For the weight loss challenge I have to weigh myself and post a photo of the scale’s reading every week. Let me tell you, I’m not looking forward to it, but it will be a degree of accountability that I haven’t had for a while. For the last year or so I’ve just been going by which pairs of pants fit at the moment! I suppose time will tell which method works better for me. Using the scale will be an interesting experiment. After seeing how empty Target was that morning I was encouraged to go to the Block at Orange to do a little outlet shopping while everyone was still sleeping off their New Year’s Eve hangover. I didn’t have much luck, but I did buy some workout clothes at Old Navy which will be just as helpful for the weight loss challenge as the scale. If I want my weight to take a downward trend in 2014 I will have to exercise regularly. But more on that in a bit. When I got home from my second shopping expedition I tackled the one New Year’s Day tradition that I don’t enjoy – taking down my Christmas tree. It’s always so wonderful decorating for Christmas (usually while watching a Christmas movie or listening to Christmas music), but putting everything away when it’s all over can be really depressing. But it had to be done, so I dismantled my tree and packed up all of the trimmings as quickly as possible to get my apartment back to its pre-holiday state. I hate leaving Christmas behind me, but it’s nice to have everything done and put away. My last task for New Year’s Day was to jump start my 2014 running regimen. I had no expectations for my first run in three weeks, but I knew it would be a victory if I just got out the door and tried. And so I put on a brand new running tank top from American Eagle, donned my New Balance running shoes (which I’m still not sure about), queued up the Christmas playlist on my iPhone for the last time this season, and ran. Although it was my slowest run ever (which was intentional because I didn’t want to get tired too quickly and get discouraged), it was a success as soon as I got started. For me the most difficult part of exercising is getting out the door. It’s all downhill (metaphorically, of course) once my running shoes hit the sidewalk and I don’t ever consider stopping until I complete my usual circuit. I just have to keep reminding myself of that when I’m tempted to stay on the couch and watch TV rather than burn some calories. My goal for 2014 is to run at 6+ miles about every other day and to run the Seal Beach 10K in April. It won’t be easy, and I know there will be setbacks, but I’m determined to do it. It’s definitely going to be an interesting journey. Well, I don’t know if I was trying to start 2014 in the best way possible or just trying to make up for my laziness in the last couple of days of 2013, but I sure got a lot done on January 1st. Here’s to a great year! 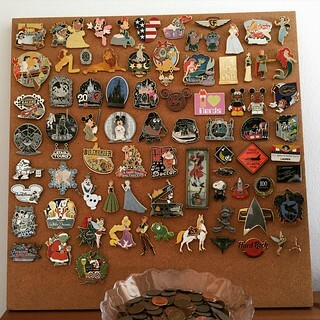 It’s only the fourth day of 2014 and I’m already behind on my webpage posts! Not that I haven’t been still been updating it every day, but I have yet to write anything about New Year’s. Terrible! So let me back up a few days and get at least partially caught up. New Year’s Eve was mostly devoted to preparing for the party I was invited to that night. The host tasked me with making a dessert and I got requests for both cake and cookies from two of the other partygoers. No problem! After a trip to the grocery store (my sugar stores were dangerously low), I quickly whipped up a batch of olive oil chocolate chip cookies (recipe to come) which my friend Joelle asked for. This was my second batch of chocolate chip cookies made with olive oil and I really like them, but more on that in a future post. When the cookies were done I got started on a chocolate pound cake, using this recipe that I found on Pinterest a while back. It’s incredibly sinful with three sticks of butter (one more than I’m used to in a bundt cake), 8 oz of cream cheese (the key to a dense and moist pound cake), and more sugar than I’d like to admit (twice what I usually use). Based on the slice I had at the party the cake itself was very tasty, but everything fell apart when I tried to frost it. The fudge icing did NOT turn out as advertised. It was more like a glaze – thin and watery – not at all “thick and rich” as the recipe described. I should have just thrown it out, but against my better judgment I poured some of the icing over the cake anyway. It didn’t make the cake any less tasty, but it made a huge mess and didn’t really improve the cake at all. But anyway, on to the party! I had a great time. Since there were so many families in attendance the party started at 6 PM and we celebrated the New Year on East Coast time so the kids could go to bed at a decent hour. And honestly the adults didn’t stay up that much longer! I was home by 10:30 PM and asleep before midnight. Party animal, that’s me. 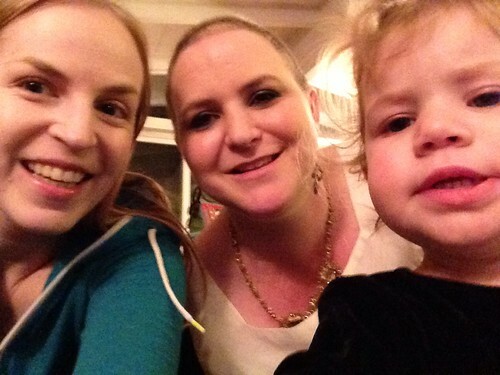 The photo I posted on January 1st is me with my friend Joelle (who finished chemotherapy back in October which should explain her very short hair!) and her daughter Sara at the party. We were coloring at the time, meaning I was removing caps from markers so Sara could use them and then replacing the caps when she was done with each one. Shortly after I took that picture Joelle took the opportunity to escape and talk to adults. I didn’t get much of that since I kept getting dragged back to the playroom by a couple of the kids any time I tried to extricate myself. At one point Joelle said, “Lauren, you’re hired.” I swear my friends invited me to their party so I would babysit! But with kids that cute I didn’t mind at all. Come back tomorrow for a New Year’s Day recap. Exciting!